I purchased this rectangular cutting board at the thrift shop this past week for $2.99. Sometimes I will wait for senior discount day but since they changed it from 25% to only 15% off it doesn't add up that much, and you always run the risk that your item will be gone. Thrifting has been pretty slow. The weather here in northern Minnesota is horrible. Twenty-five below this morning. I purchased this metal pitcher for 99 cents at the same thrift shop. 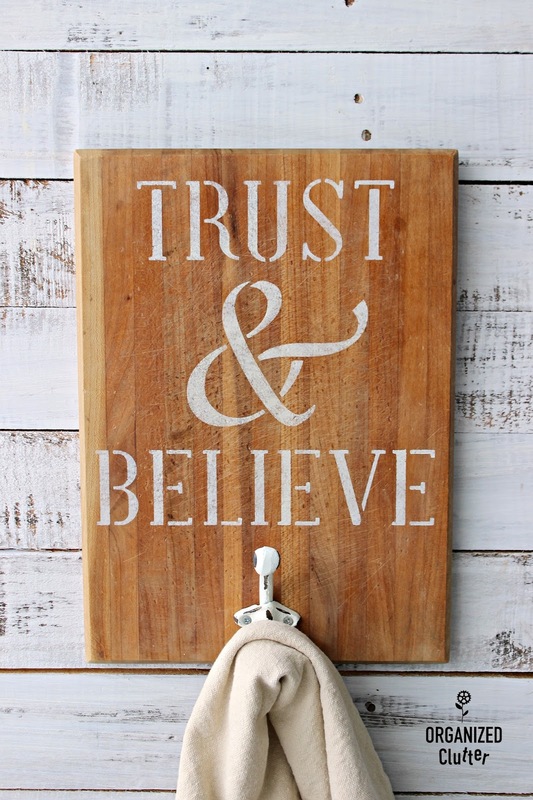 It has it's original price tag on the bottom for $12.99 from the Ashland Home Collection. I think from Michael's maybe. 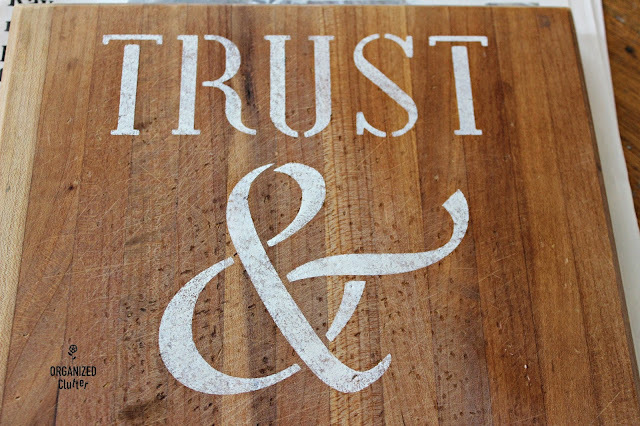 When I purchase a cutting board that has been used, I normally wash it first with hot soapy water and Dawn dish soap. I do not submerge it in the dishwater. Then I spray the cutting board with KRUD KUTTER , and wipe it down with a damp terry rag. Cutting boards normally have been oiled, and you need to knock down the greasiness before painting or stenciling. I use blue painter's tape to secure my stencils to the project piece. 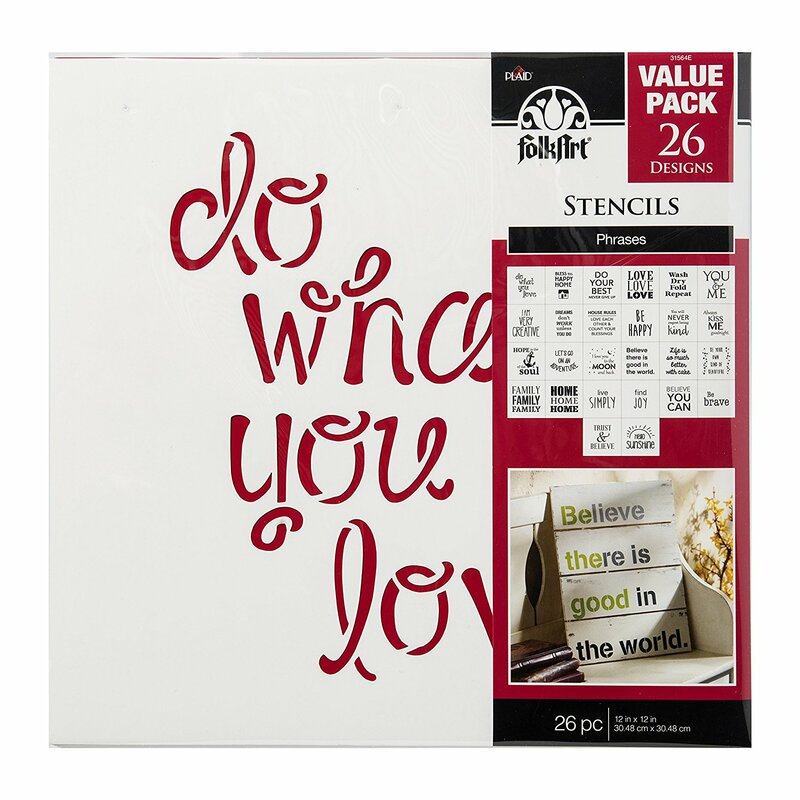 The Trust & Believe stencil was one of the die-cut card stock stencils in the FolkArt Stencils, Phrases (26-Pack) . 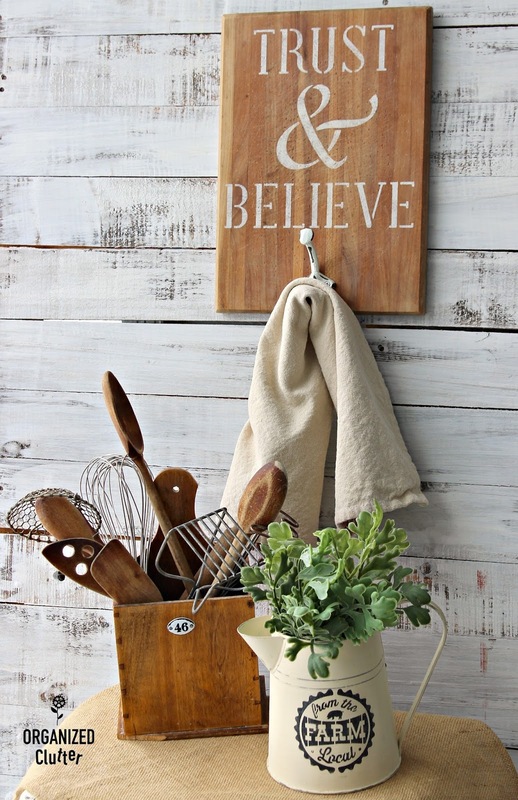 I added a white iron hook from Hobby Lobby to the bottom of the cutting board. I pounced on the stencil with a Dreamweaver Brush and Ceramcoat Acrylic Paint in Buttercream . Look at the the pit marks on the cutting board from use. 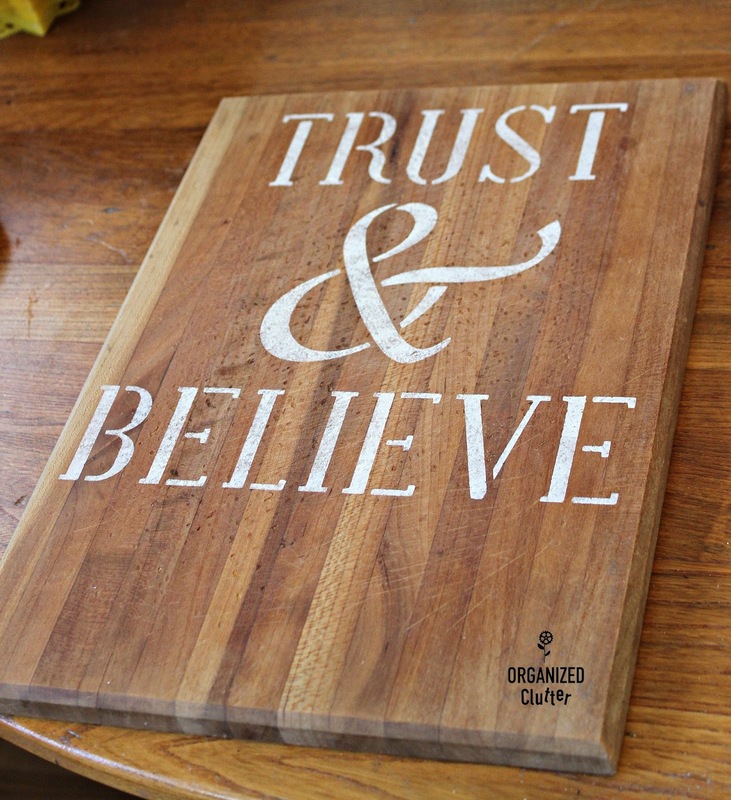 The cutting board looked so dried out after washing it and using the Krud Kutter, that I sealed the stencil and darkened the wood tone with Minwax Paste Finishing Wax in Natural . I applied the wax with a paper towel. 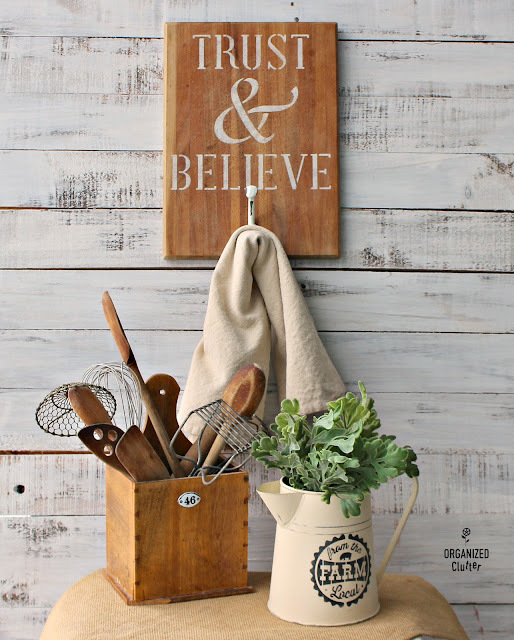 My cutting board sign/coat hook is perfect for a farmhouse style kitchen. 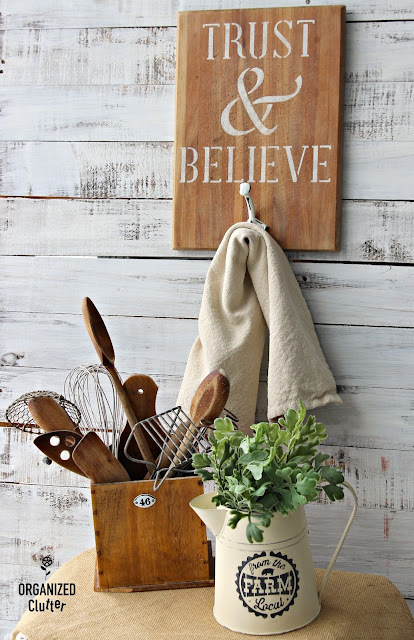 Hang a a dishtowel on the hook! Details on my dovetailed "46" utensil box are here. And how about that upcycled thrift shop pitcher? I brush painted it with two coats of Chiffon Cream Chalked Paint . Then sanded it with 220 grit sandpaper to distress the edges and knock down the brushstrokes. 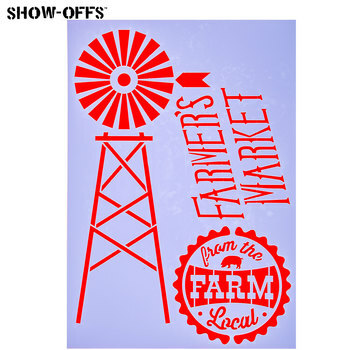 I then used a Hobby Lobby stencil to add the farm seal with Ceramcoat black craft paint. I sealed the pitcher with the Minwax Paste Wax too. I love both upcycled pieces! So easy. So inexpensive. I'm not a football fan at all, so I would much rather be looking at upcycled makeovers. Love both of these they both turned out so pretty. I like the utensil box as well, and I think that I may have a box in my thrift store stash that may work as a utensil holder. I will have to go check that out. Thanks for sharing some more fun projects! 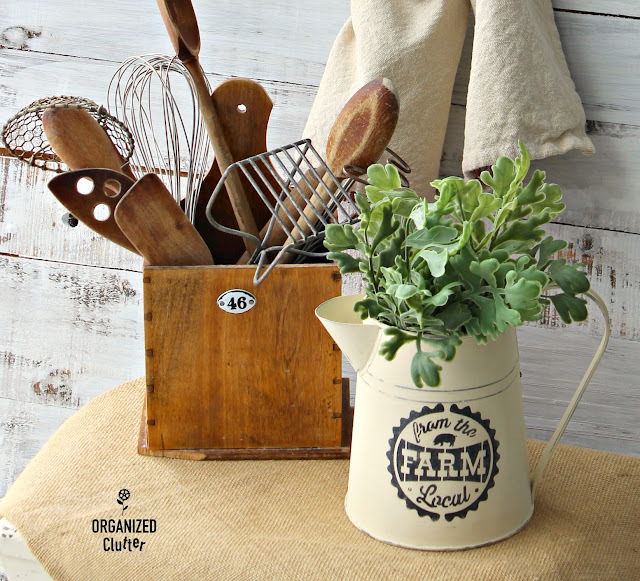 Two very cute additions to a farmhouse kitchen! Your upcycles are always so clever!